The Peregrine Falcon is large and powerful and one of Britain’s most impressive birds of prey. It has long, broad, pointed wings and a relatively short tail. It is blue-grey above, with a blackish top of the head and an obvious black ‘moustache’ that contrasts with its white face. Its breast is finely barred. It is swift and agile in flight, chasing prey. Warwick District Council are working in partnership with Warwickshire Wildlife Trust and have placed a nesting box and webcam at the top of the tower of Leamington Town Hall. The webcams are live so you can watch the Peregrine Falcons 2019 nesting season! Vélo Birmingham and Midlands (formerly Vélo Birmingham) will be coming to our area on Sunday 12th May 2019 – a 100 mile route on closed roads. If you wish to take part in the bike ride, or are interested in a volunteering role, or simply wish to be a spectator, please visit the Vélo Birmingham and Midlands website for all the information. The 100 mile route will be fully closed on Sunday 12th May and it will not be possible to cross or drive along the route in a vehicle. It is strongly recommended to plan any journeys on the day well in advance and for residents living very close or on the route, parking a short distance away ahead of the road closures may be advisable. A map of the route is available here. Entries are now open for the 36th Knowle Fun Run on Sunday 19th May 2019. Knowle and Dorridge Lions have already opened their website for prospective runners with a new entry system. Runners can enter for 1 lap (5km) or 2 laps (10km) on traffic free roads. There will also be an opportunity for children to take part in the Fun Run with runs around Arden School playing fields. 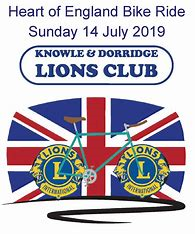 This year’s Knowle and Dorridge Lions 36th Charity Fundraising Fun Run is in aid of the UK Sepsis Trust, SoLO Life Opportunities and Lions locally determined causes. Hosted by Fiona Bruce and a team of antiques experts, the show is a free, fun, family day out. For further information regarding attending the valuation day at Compton Verney, please visit the BBC’s Antiques Roadshow website where you will find everything you need to know, including some very helpful FAQ’s. Entries are now open for the 14th Heart of England Bike Ride from Packwood National Trust House(map),on Sunday 14th July 2019. All riders must return to Packwood House by no later than 3.00pm, when they will be able to pick up their Certificate of Achievement, enjoy a hot dog from the Lions BBQ and a FREE visit to Packwood House & Grounds.